We’d love your help. Let us know what’s wrong with this preview of The Man in the Crooked Hat by Harry Dolan. To ask other readers questions about The Man in the Crooked Hat, please sign up. is there any quotes in the book that prove jack is a hero? I don't like serial killer books where the excuse for the murders is that the serial killer is "crazy", so I was relieved to find that this isn't one of those stories. Set in Detroit, Jack Pellum is an ex-cop whose wife Olivia was murdered. The reader, but not Pellum, knows from the first chapter that Olivia's murderer was Michael Underhill. The story is a search for the reason behind that murder. Pellum is now spending most of his time putting up flyers searching for a man in a crooked hat who I don't like serial killer books where the excuse for the murders is that the serial killer is "crazy", so I was relieved to find that this isn't one of those stories. Set in Detroit, Jack Pellum is an ex-cop whose wife Olivia was murdered. The reader, but not Pellum, knows from the first chapter that Olivia's murderer was Michael Underhill. The story is a search for the reason behind that murder. Pellum is now spending most of his time putting up flyers searching for a man in a crooked hat who he suspects is the killer. His suspicions lead him to several other crimes that might be linked to the man in the crooked hat. There is a pretty high body count in this book, but by the end each killing had been logically explained. Underhill has an interesting back story and I understood perfectly why his first murder was committed. I even agreed with him. Pellum is also an interesting, obsessed character and a good detective. I can see him continuing in other books if the author decides to make this into a series. I had never heard of this author before but, since I liked the writing style and the twisty plotting of this book, I will probably read more by him. The Man with the Crooked Hat sounded like an excellent read. It’s about a detective trying to solve his wife’s murder. He thinks it was done by a serial killer. The story follows him as he unravels the clues to confront the murderer. It is a psychological thriller, which is not my usual genre. In all reality, I was left disappointed at the ending. The writing was hard to get into. The author tended to write in short choppy sentences, and it felt disjointed to me. I had a hard time getting into t The Man with the Crooked Hat sounded like an excellent read. It’s about a detective trying to solve his wife’s murder. He thinks it was done by a serial killer. The story follows him as he unravels the clues to confront the murderer. It is a psychological thriller, which is not my usual genre. In all reality, I was left disappointed at the ending. The writing was hard to get into. The author tended to write in short choppy sentences, and it felt disjointed to me. I had a hard time getting into the story. He wrote from both the detective’s perspective and the murderer, which I don’t really care for. So I knew who had killed the wife, it was just a matter of figuring it out why she was killed. I just couldn’t get into the characters. I felt like Jack Pelum was too whiny, and Micheal Underhill was very odd. I felt unsatisfied by the time the story ended. Fast-paced, intricate plotting, interesting characters, many twists and turns. For me, the only detractions were a few too many serendipitous occurrences and twists near the end. this was only ok for me at times, and other times I was hooked. I didn't feel a connection with the protagonist. 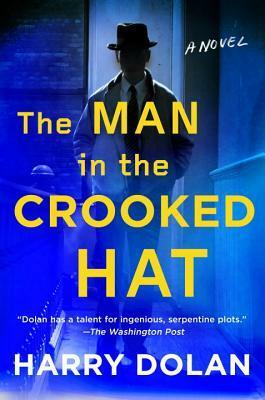 The Man in the Crooked Hat is the latest book from Harry Dolan. This was a first read of this author for me, but it will certainly not be the last! Dolan's writing is clever, his plotting serpentine and his characters intriguing, making for an addictive read. Jack Pellum is a former police detective. When his wife is murdered, Jack goes off the rails. The case remains unsolved after two years, but there is a clue that Jack is sure will lead him to the killer. The man wears a crooked hat. 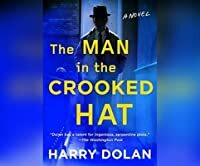 A recent The Man in the Crooked Hat is the latest book from Harry Dolan. This was a first read of this author for me, but it will certainly not be the last! Dolan's writing is clever, his plotting serpentine and his characters intriguing, making for an addictive read. Jack is a great character, well fleshed out in both personality and personally. I liked his voice. Dolan gives him snappy dialogue, but also an introspective internal look at grief, loss and love. Jack is juxtaposed with Michael Underhill. Yes, we know the name of the killer and he too has a voice. A frightening one, as he can justify everything he's doing and has done. "This is as much on you as it is on me. I'm not going to feel bad about this." We get to see inside Underhill's personal life as well. The plotting of The Man in the Crooked Hat does not follow a straightforward path - instead it is, well, crooked. We know who the killer is - or do we? Dolan's plotting is delightfully complex, with minuscule clues that need to be connected. A clever cat and mouse game. Quite a strange, quirky book. This is the first book I have read by this author. My rating was a three, but in the end I raised it to a four, simply because it kept my interest. You know from page one who the murderer is, but you don't find out the why's until late in the book. I may try another book from this author in the future. Dolan's last book really knocked it out of the park so I had high expectations for this one, but I found this one to be just your average competent mystery. Relies too heavily on the tropes I like to see subverted (man obsessed with wife's death, man whose every hunch is always correct, etc.) and the plot itself didn't do anything particularly novel. Meandering tale that takes it's time in the telling. Slowly the clues add up as the story moves along. A big cast of characters/bodies along the way. No who done it here. We know from the beginning "who", we just have to wait to see how and why as the mystery unfolds. Interesting read. Jack Pellum is a tortured man. His wife has been murdered. He has one goal. That goal is to find the man in the crooked hat...that’s the man who murdered his wife. Matters are complicated because Jack is a former policeman. Jack’s father is a powerful judge with good intentions for his son. He interferes with Jack’s mission. Jack posts flyers, investigates, talks to people...to get what he wants...finding the man with the crooked hat. I wanted to read this book mostly because of the author. I loved The Last Dead Girl...another amazing book written by him. Readers who love really good mysteries...complex and unputdownable...will love this author’s book. I've read books before by Harry Dolan and enjoyed them - he is a very talented, assured writer. The Man in the Crooked Hat was another well-written addition to his repertoire. An added bonus: the story should appeal to readers who are not strictly mystery fans, as there was more depth and heft to the story than say, a typical thriller or action-based mystery. Another reviewer included that the book was more 'literary' and I'd agree with that. The only reason I gave the book 3 instead of 4 stars I've read books before by Harry Dolan and enjoyed them - he is a very talented, assured writer. The Man in the Crooked Hat was another well-written addition to his repertoire. An added bonus: the story should appeal to readers who are not strictly mystery fans, as there was more depth and heft to the story than say, a typical thriller or action-based mystery. Another reviewer included that the book was more 'literary' and I'd agree with that. The only reason I gave the book 3 instead of 4 stars is I'm not overly fond of books that go back and forth between different narratives and characters - although I can understand why the book was laid out in this fashion. I wouldn't let this stop anyone from reading this book however - and to try other books written by Mr. Dolan as well. Recommends it for: mystery/suspense fans. Although most users classify this as a mystery, we readers find out in the first chapter that the killer is Michael Underhill, whose victim in that chapter is the wife of the MC, Jack Pellum. Jack is a former detective who is obsessed with finding out who killed his wife about three years earlier. The only mystery for the reader is WHY he killed her, but do I care? I generally love mysteries but not pure thrillers, and among the genre, I am tired of reading about serial killers. However, this di Although most users classify this as a mystery, we readers find out in the first chapter that the killer is Michael Underhill, whose victim in that chapter is the wife of the MC, Jack Pellum. Jack is a former detective who is obsessed with finding out who killed his wife about three years earlier. The only mystery for the reader is WHY he killed her, but do I care? I generally love mysteries but not pure thrillers, and among the genre, I am tired of reading about serial killers. However, this differs from the usual thriller trope, in that it is less of an adventure and action story and more like a police-prodedural investigation. To my surprise, I actually enjoyed this standalone story, which was well-written and suspenseful. Structurally, this reminds me of Very Bad Men, the other book by this author that I read several years ago. Like that story, this book spans a long time and involves so many characters that it is helpful to write down the names of various people to remind yourself who they were when mentioned later. I wonder whether all his plots proceed in this way. I'll have to wait until I've read The Last Dead Girl, which apparently is a prequel to the David Loogan series. From the publisher: Jack Pellum is a Detroit detective who left the force after his wife was murdered in a random attack. But Jack never bought that theory, and the case was never solved. Eighteen months later, Jack is working as a part-time private investigator while continuing the hunt for an elusive person of interest in his wife’s murder: a man in a fedora who Jack is convinced could break open the case. When a local writer’s cryptic suicide note suggests the man in the fedora actually exist From the publisher: Jack Pellum is a Detroit detective who left the force after his wife was murdered in a random attack. But Jack never bought that theory, and the case was never solved. Eighteen months later, Jack is working as a part-time private investigator while continuing the hunt for an elusive person of interest in his wife’s murder: a man in a fedora who Jack is convinced could break open the case. When a local writer’s cryptic suicide note suggests the man in the fedora actually exists, Jack picks up the thread he’s certain will lead him to his wife’s killer. He never imagined it would also unravel twenty years of secrets and unsolved crimes or make him the target of a psychopath trying to erase his own past. In the early pages of the book, Jack meets Paul Rook, 26 years old, whose mother was killed nine years earlier, and who shares a similar obsession, trying to find a man in a fedora who he thinks killed his mother. When Jack asks him what he thinks the man’s motives are, the reply he receives is “’He kills people. He doesn’t have motives.’ He tells Paul that he has been doing his own sleuthing, and that he’s ‘found sightings of him. Some of them go back years. The earliest one I’ve found was twenty years ago. It happened about thirty miles from here, in a town called Belleville. I think the man in the hat got his start there’ . . . Paul had told him about more than a dozen murders - - each one with a witness who claimed to have seen a man in a hat. The sightings took place at different times, sometimes on the day of the murder, sometimes in the days before. Never at the scene of the crime. ” Jack then is told about another boy who was killed, about a month later, in a town six or seven miles from the scene of that murder. Jack is relentless in his search, and at times I must admit it became a bit too much of a slog for this reader. But the tension and the suspense mount, and almost before one realizes it one is caught up in the investigation almost as much as its protagonist. In the very first pages of the book we meet Michael Underhill. It is over 70 pages later before we meet him again. But surprisingly, that doesn’t lessen the suspense. Even when we learn “who,” the “how” and “why” are absorbing, and the resolution is very satisfying. The novel is highly recommended. Detective Jack Pellum's wife, Olivia, was murdered as she took photos by a lake, and every day since then he has been doggedly following one possible clue: a man in a crooked hat he had glimpsed days before her death. Jack leaves the police force and working as a private investigator peppers the streets with flyers of a crude drawing of a man in a crooked hat. As fate would have it, a suicide leads him to the first of a handful of unsolved murders. Was his wife's murder random as it appears thes Detective Jack Pellum's wife, Olivia, was murdered as she took photos by a lake, and every day since then he has been doggedly following one possible clue: a man in a crooked hat he had glimpsed days before her death. Jack leaves the police force and working as a private investigator peppers the streets with flyers of a crude drawing of a man in a crooked hat. As fate would have it, a suicide leads him to the first of a handful of unsolved murders. Was his wife's murder random as it appears these were? Or are they all connected to the man in the crooked hat, making Jack's search more than what many think is a desperate man's hopeless obsession. Dolan, apparently, is noted for his intricate plotting. My instinct says "thriller" following with "never mind". But fortunately, Man in the Crooked Hat has changed my mind, at least in the case of Dolan. Highly intricate. Lots of characters. But the pace is measured until the pace itself heightens the tension. Jack Pellum, the protagonist, former cop, with a murdered wife. A father that keeps trying to fix Jack's life and has the money and political connections to do just that. The murderer at Dolan, apparently, is noted for his intricate plotting. My instinct says "thriller" following with "never mind". But fortunately, Man in the Crooked Hat has changed my mind, at least in the case of Dolan. Highly intricate. Lots of characters. But the pace is measured until the pace itself heightens the tension. Jack Pellum, the protagonist, former cop, with a murdered wife. A father that keeps trying to fix Jack's life and has the money and political connections to do just that. The murderer at work in the first chapter, by name. As the characters move in and out of focus, they do so with the slightest tinge of unreliability. Or with a genuine ability to love. Or not, when love is expected. Jack Pellum is a very interesting character who is obsessed with finding the man who murdered his wife and is determined to solve the mystery. As we follow Jack, there are many twists and turns along the path and many events that rely on one another to lead him to the end. I am looking forward to reading another book by Harry Dolan. I received this book for free in exchange for an honest review. Jack Pellum is a broken man. Two years ago, he saw a man in a crooked hat watching his wife. The next day she was murdered. He's left his job as a police detective to concentrate solely on finding his wife's murderer. He has been posting hundreds of flyers with a vague drawing of the suspect. But now he has stumbled across others who think they saw a man in a crooked hat before other murders. Is there a serial killer on the loose or are none of the crimes related? Harry Dolan writes a great book. Th Jack Pellum is a broken man. Two years ago, he saw a man in a crooked hat watching his wife. The next day she was murdered. Twisty and turning plot kept me up many a night when I really should have been enjoying my beauty sleep! Harry Dolan is a writer worth spending time with. I eagerly await his next book! Do your self a favor and run out and get this one! Got this book from the library as a blind date with a book. It was okay. You find out at the beginning who the killer is. The rest of the book tells how Jack goes about catching him, then what happens when Jack finds him. This was a pretty light read considering it was about a serial killer. Even though you know who it is in the first chapter it is still kind of a surprise ending. A great mystery! Clearly written and not confusing at all but a perplexing mystery as it should be! Sadly it is the last Northshire Selects book from my Christmas gift last year. I can’t say enough good things about the selections I have received from them. Support your local bookstores, folks! This was my first experience with Harry Dolan, and I’m definitely going to look into more! Jack Pellum was an interesting character, searching for the man who killed his wife. The reader knows from the beginning who the killer is, though we don’t know the motive. Jack looks into other murders around the area, wondering if perhaps they’re related and if he’ll find the man in the crooked hat if he could just solve them. Jack, and the reader with him, follows many twists and turns on the road to th This was my first experience with Harry Dolan, and I’m definitely going to look into more! Jack Pellum was an interesting character, searching for the man who killed his wife. The reader knows from the beginning who the killer is, though we don’t know the motive. Jack looks into other murders around the area, wondering if perhaps they’re related and if he’ll find the man in the crooked hat if he could just solve them. Jack, and the reader with him, follows many twists and turns on the road to the man in the crooked hat. The characters were interesting and well developed. I liked the way the book bounces from Jack and his search to Michael and his “normal” life. The book was very engaging and I enjoyed it a great deal. I’d definitely recommend his book! This is my first Harry Dolan novel but this book, at least, struck me as a crossover between a literary novel and a PI crime-solver. That’s a good thing, in my mind, in that it gives the book a literary depth well beyond the typical mystery or serial PI series. That depth, however, does slow the pace a bit. That’s not a criticism in any way; just a warning, depending on what you’re looking for. It reads like a novel. The best PI’s in literature are always brooding, brilliant, and a bit lost. They This is my first Harry Dolan novel but this book, at least, struck me as a crossover between a literary novel and a PI crime-solver. That’s a good thing, in my mind, in that it gives the book a literary depth well beyond the typical mystery or serial PI series. That depth, however, does slow the pace a bit. That’s not a criticism in any way; just a warning, depending on what you’re looking for. It reads like a novel. The best PI’s in literature are always brooding, brilliant, and a bit lost. They’re the big-hearted under-achievers that are always on the outside looking in on a normal life but the man or woman you want to have your back or be your friend. Jack Pellum, the protagonist here, is just such a man. A former detective, Pellum’s wife is murdered and the police are without a suspect. Pellum, of course, carries the burden of finding her killer to the point of obsession. He ultimately uncovers the truth, but it is a complex and serpentine path of criminality that makes “the butler did it” look childish in its simplicity by comparison. Jack is the son of a very well connected federal judge who is over-bearing and meddling, but that tension never gets fully developed. That doesn’t detract from the story but I was left with some anticipation that never quite got fully satisfied. Perhaps in a future work. The book itself is not set in New York, Palm Beach, or Los Angeles, which in and of itself sets it apart. The plot unfolds in Detroit, a city of rich contrasts. Once a bustling metropolis that boasted an architecture and cultural scene that rivaled cities many times its size due to the wealth created by the automobile, it is a city struggling, with some success, to reclaim its lost glory. It is both a bit magnificent and gritty at the same time. There are plenty of twists to the plot, mostly unforeseen, and none goes so far as to risk crossing the line that holds the suspended disbelief intact. The writing is excellent and the dialogue, in particular, is crisp and efficient, but remains human, as you would expect in a good literary novel. Dolan is a first-rate storyteller and a first-rate writer and the two qualities together make for an outstanding read. I have no doubt that this author will continue to build on his past success. It is richly deserved. The Man in the Crooked Hat by Harry Dolan is a standalone murder mystery. Jack Pellum, an ex-cop, is our hero. Two years ago, Jack’s wife was murdered, and he is obsessed with finding the murderer, which eventually cost him his job. Even his detective friends try to get him to move on. But Jack can’t rest, and uses every moment to put up flyers about a man with a crooked hat, which was his only clue to the killer. The main difference in this murder mystery is that we know from almost the beginni The Man in the Crooked Hat by Harry Dolan is a standalone murder mystery. Jack Pellum, an ex-cop, is our hero. Two years ago, Jack’s wife was murdered, and he is obsessed with finding the murderer, which eventually cost him his job. Even his detective friends try to get him to move on. But Jack can’t rest, and uses every moment to put up flyers about a man with a crooked hat, which was his only clue to the killer. The main difference in this murder mystery is that we know from almost the beginning, who the murderer is. Michael Underhill has finally found his life coming together. He was a beautiful girlfriend, who loves him, and makes him happy; this is the life he wants badly, and he will let nothing change that. After awhile, when Jack begins to weaken his resolve, he gets a message and meets someone else looking for the man with the crooked hat. This will bring Jack to a small town, which will lead to various clues of previous murders that maybe related, even as far back as twenty years. The mystery is chilling, as there are many twists that will reveal a cunning murderer, and several deaths that are remotely connected. Jack being an experienced former detective, as well as driven by his wife’s death, is probably the only one who can possibly to tie the strange pieces together. What follows is an exciting story and at times early on, a bit confusing. It was also an amazing in depth mystery, that involves several crimes, with various people, deaths that occur over the years, and those that had no real relation to each other. Slowly, with a POV of mostly Jack, but some with Mike Underhill, we learn the consequences that lead to Jack’s wife’s death, as well as some other recent deaths. I do not want to give spoilers, and this is a difficult review that telling too much more would ruin it for you. The Man in the Crooked Hat was an excellent murder mystery that kept me turning the pages, especially in the last half, which started to make more sense with each revelation. If you enjoy murder mysteries, a flawed but great leading character, in depth storytelling, very good secondary characters, a conniving murderer, and many twists and turns along the way, I suggest you read Harry Dolan’s The Man in the Crooked Hat. In Harry Dolan's The Man in the Crooked Hat, an ex-cop haunted by his wife's unsolved murder follows a string of seemingly disparate murders in hopes of unmasking a clever murderer. Jack Pellum refuses to stop looking for his beloved wife Olivia Makinnen's killer and he is hopeful a new lead will finally provide the answers he is searching for. He is certain someone he spotted near their apartment right before Olivia's death, a stranger wearing a hat, is the person who murdered his wife 4.5 stars. Jack Pellum refuses to stop looking for his beloved wife Olivia Makinnen's killer and he is hopeful a new lead will finally provide the answers he is searching for. He is certain someone he spotted near their apartment right before Olivia's death, a stranger wearing a hat, is the person who murdered his wife. When his ex-partner tells him about that Danny Cavanaugh, who recently committed suicide, left a cryptic message about a killer who wears a crooked hat, Jack immediately starts investigating the puzzling lead. A friend of the recently deceased, Paul Rook, is another link to a possible murder by the man in the hat. Even more promising, Paul has a file of unsolved murders that stretches back decades and provides Jack with a new place to begin his investigation:Danny's brother Alex's never solved homicide. Thus begins Jack's latest quest in his eighteen month hunt for Olivia's killer. Jack is tenacious and determined to find the person responsible for murdering his wife. He spends day after day putting up flyers in hopes that someone will recognize the man in the hat. Danny's suicide is the first concrete information that the man in the hat might just be real, but finding the connection between the dead man's message and his wife's killer might be impossible. That is until Paul shows up with a stack of unsolved murders that also mention the man in the hat. Jack knows tying these deaths together with take a herculean effort but he is definitely up to the challenge. While Jack has no idea who killed his wife, readers know from the very beginning that Michael Underhill is Olivia's murderer. What no one, including Jack, knows is why Michael killed her. As Jack begins untangling the very complicated threads that might tie Underhill to the other murders, readers are provided with intriguing peeks into the life Michael is building with Anna Haley. She has no idea what the man she loves has been up to nor does she have a clue how far he is willing to go to ensure her happiness. With Jack gaining traction in unraveling the complicated trail of unsolved murders, will he finally find justice for Olivia? I don't say this often but this novel deserves this praise: this was a seriously well-written and well-executed mystery. It is rare to have an author introduce such a complicated premise with a high body count, and yet make everything make sense. I loved the author' delivery style because he made Jack's story very personal; I felt very sympathetic towards Jack and I wanted him to get what he wanted. In the beginning, it really did feel like a wild goose chase because the initial clues seemed so I don't say this often but this novel deserves this praise: this was a seriously well-written and well-executed mystery. It is rare to have an author introduce such a complicated premise with a high body count, and yet make everything make sense. I loved the author' delivery style because he made Jack's story very personal; I felt very sympathetic towards Jack and I wanted him to get what he wanted. In the beginning, it really did feel like a wild goose chase because the initial clues seemed so insubstantial. And I think that was the point; every character in this novel points out how fixated Jack is on these clues and the author wants the reader to also see that crazy side. But as the story starts to come together, and the narrative and clues begin to make sense, the author starts to make you rethink. As I mentioned before, there is a high body count and that worried me in the beginning because I really didn't want the author to just throw out some weird tie-in or conclusion. But the author didn't do that. Instead, he broke apart the murders and made it all make sense. There was logic in this story, and it was something I was really happy to see because it honestly doesn't happen very often. I also liked all of the characters the author created; even the minor characters had enough development that the reader could form a connection or opinion about them, which was really nice. Overall, this was a very good mystery and I cannot wait to read more by this author! I'm giving this a 5/5 stars! Thank you to Penguin Random House and the First to Read program for this ARC in exchange for an honest review. This was such a unique plot and cast of characters that I've been avoiding reviewing it, not because it wasn't good, but because I couldn't put its uniqueness into words. Honestly, I still can't, so here goes. The creepy man in the hat is in the deep background of many murders and suicides through the years, so deep, that the cops usually aren't even told. A brother may have seen him the day before his sibling's bicycle accident that took his life, days before his wife's death, the main character This was such a unique plot and cast of characters that I've been avoiding reviewing it, not because it wasn't good, but because I couldn't put its uniqueness into words. Honestly, I still can't, so here goes. The creepy man in the hat is in the deep background of many murders and suicides through the years, so deep, that the cops usually aren't even told. A brother may have seen him the day before his sibling's bicycle accident that took his life, days before his wife's death, the main character, Jack Pellum, saw a man in a hat that caught his eye in the crowd and for some reason, his presence made Jack uneasy to the point that even two years after his wife's death, he still thinks that man has something to do with it. Jack's powerful dad financially supports his son and helps him when he gets into legal messes, but pities him for his loss and thinks he needs to move on, both from his loss and this obsession with this man in the hat. The Jack meets someone that has tied other deaths to the man in the hat tangentially so Jack goes in search for answers. Answers that others may not like and definitely cause upheaval in the lives of those that thought they had moved on from their own losses, some over twenty years ago.